Thanks for sharing Matt! This is definitely, the way I will be sourcing my Connecting The Dots With The Respect Principle team! Hello! This email from TED regarding my application is copied and pasted from my Inbox below to inform you. Please excuse the formatting as I wanted to keep the original content as initially received. Thank you for applying to be a TED2019 Fellow. The response to the Fellows program continues to be extraordinary — the size and exceptional nature of each application cycle is more impressive than the last, making decisions increasingly difficult. Unfortunately, due the to phenomenal nature of all of our applicants, we are unable to offer you a Fellowship for TED2019. Thank you again for taking the time to apply. The passion so evident in your application will undoubtedly bring you success in your current and future endeavors. We thank you for your support and hope that you continue to be a part of the TED community through TED.com, TED-Ed, the Open Translation Project, and the TEDx program. To stay connected and receive updates about future application cycles, subscribe to our newsletter and follow us on Instagram, Twitter and Facebook. Copyright © 2019 TEDTalks, All rights reserved. Some things don’t work out because they are not the right time or in this case, not the best next step. Receiving the fellowship would have meant travelling 12 times a year and even though fellowship costs are covered by TED, the commitment would have meant additional expenses not covered, plus a lot of time away that would not have been good given current living arrangements. Plus, since the school video production contest is going to be much bigger than initially planned, the fellowship would have hampered rolling out the contest, writing the next book, and all the work necessary to grow and expand as now targeted. Phew! Of course, I am still preparing to do my TED talk at some point, starting with the new short video speech I am currently working on. Thanks to the five people I have been blessed to meet and work with, whether as friends or in professional capacities. This diverse, talented group of people generously agreed to support and encourage my work, Connecting The Dots With The Respect Principle, and me by reviewing my applications for presenting in a TED Talk the power and benefits of respect as a global foundational belief, plus for my application to become a TED Fellow. Becoming a TED Fellow provides the opportunity to work with other people dedicated to making the world a better place with fresh perspectives and new initiatives. Next on the list is applying for the 2020 TED Prize, now called, The Audacious Project since the 2019 deadline has passed. In the meantime, it is time to pull the team together … an agent, a or a few publishers to print books, and the printing, production, and filming of Charles’ Choice to deliver to the people, raising awareness, fostering healing, and freeing potential, while also generating sales to keep rolling out the global initiative … because everyone matters. Thanks again to my references and to those who publicly or privately have added their support and encouragement to help me support and encourage others to believe they and their unique selves do matter. “Take the first step in faith. You don’t have to see the whole staircase, just take the first step.” Dr. Martin Luther King Jr., one of my role models. Another step on the staircase for me is submitting my TED Fellowship application! Thanks TED for the opportunity and references for making this possible! 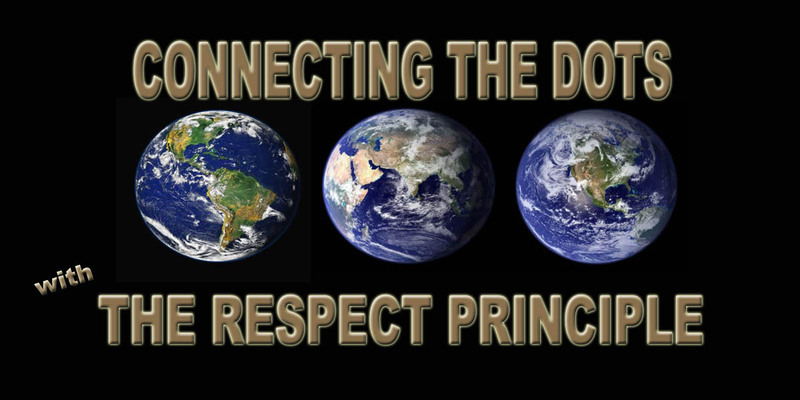 And of course, thank God for putting the “Connecting The Dots With The Respect Principle” concept and global initiative into my heart, mind, and spirit, plus what I need to fulfill the mission!